Once the words are on the page or on the screen, they’re physical objects (out there in the environment) that we can see and move. Now we’ve embarked on a three-way conversation of mind-brain-environment. We’re in a making-finding cycle, in which we are partnered with the world, rather than being isolated in our own head. 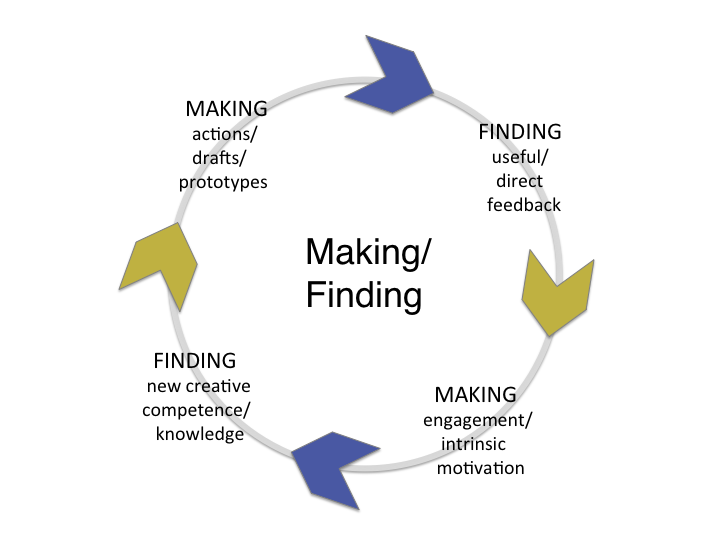 The continuing cycle of making and finding. By taking tangible actions in pursuit of our creative goals (making) we promote informative and sometimes surprising discoveries (finding). We can nudge and noodle and rearrange. The shapes and sounds of the letters, the syllables, the words and phrases, become tangible things that we can structure and connect, or even set aside. Don’t wait for inspiration (or perfection). Make writing a varied but stubborn habit. Start anywhere: beginning, middle, end, or revising what you wrote the day before. Sneak up on writing; it doesn’t need a red carpet. Ask your body to help. Move and keep moving through space — a walk can work wonders. If you’re stuck, explain to a kindred spirit where you are and where you’re headed. Or back-up one or several steps, and closely resurvey the options. Capture your emerging thoughts right away. Preserve and periodically reshuffle your growing treasure trove of ideas. They may be starting points for a new chapter, a new episode, or a plot turn. Featured image: Writing on keyboard. CC0 via Pexels. Wilma Koutstaal is a psychology professor at the University of Minnesota, with a Ph.D. in experimental psychology from Harvard University. 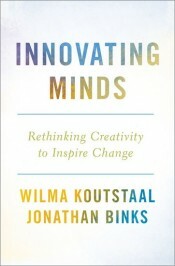 She is the author, with Jonathan Binks, of Innovating Minds: Rethinking Creativity to Inspire Change and author of The Agile Mind (winner of the 2012 William James Book Award from the American Psychological Association). She was recently named an AAAS Fellow. Follow her on Twitter @think_afresh or at innovatingminds4change.com. Great points overall. I especially relate to the suggestion to get things down right away. It’s too easy to forget “that really brilliant thought” with all that’s going on. Building on your point of making writing a habit, you can mark a calendar with the days you’ve sat down to write. The visual reference can be really motivating. Great post. I agree with all your comments, but I especially like the first two – make writing a varied but stubborn habit, and sneak up on it. going to try both.Thanks.